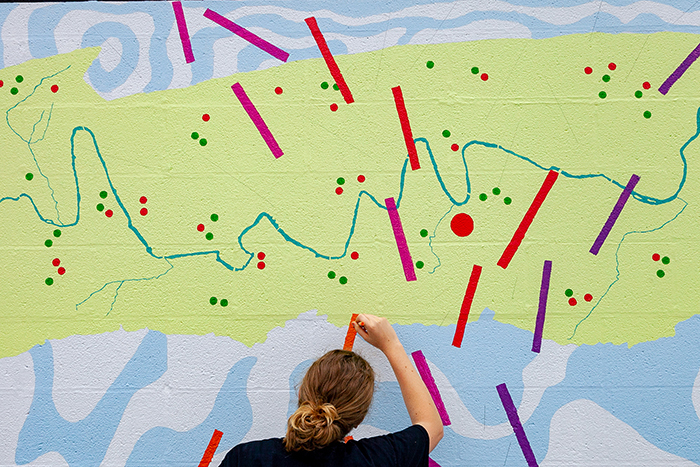 Designed by visiting artist Deirdre Murphy and painted by students, the 2018 Goodyear mural indicates bird population levels and migration patterns along the Conodoguinet Creek in Carlisle, Pa. Photo by Carl Socolow '77. At first glance, it looks a little like a cave drawing or a stylized printout from a life-support machine. Look closer and you’ll find a colorful lesson about Carlisle’s Conodoguinet Creek, and the native-bird population that depends on it, backed up by data provided by faculty members, the Center for Sustainability Education and the Alliance for Aquatic Resource Monitoring (ALLARM). You’ve just discovered the 2018 Goodyear Gallery mural, painted Sept. 22-23 by a visiting professional artist and students in art, biology and environmental-studies classes. Plans are to add painted QR codes in the spring, pointing to related current student research. The mural is an annual studio-art department project, bringing a different professional artist to campus each fall to collaborate with students on a public work. Each is painted on top of the last, on an outer wall of the Goodyear Gallery. This year, it's designed by Philadelphia artist Deirdre Murphy, who explores the intersections between environmental justice, science and art, working side by side with scientists and creating art that visualizes their findings. Philadelphia artist Deirdre Murphy works with scientists in the field and in the lab, and creates artwork that communicates their findings. Photo by Carl Socolow '77. Murphy began to create research-infused art 15 years ago, with an artistic residency at Hawk Mountain Sanctuary, where she stayed in scientific quarters and worked on location to produce art communicating how climate change has affected the migratory pattern of raptors (a 2014 installation based on that research is on view at the Philadelphia International Airport). More residencies followed—including one at the Carnegie Museum’s Powder Mill Nature Preserve, where Murphy observed and helped count songbirds traveling along the Atlantic flyway. She’s now creating a print on migrating birds along the Delaware watershed, with funding from a University of Pennsylvania environmental-humanities grant, while also embarking on a residency at a Philadelphia molecular-biology lab, where scientists work to find cures for mosquito-borne illnesses. "Scientists are trained to be visually acute, and so are artists—even though we're looking for different things. So for me, it's been a natural pairing," says Murphy, the daughter of a scientist, who adds that she's long created artworks depicting patterns in nature. "And scientists want to get the word out—whether as a call to action or to show the ways that science has a direct and positive impact on our lives. Art is a powerful way to communicate that message." Leading up to the Goodyear design, Murphy worked closely with Dickinson scientists and staff. Jinnie Monismith, assistant director of ALLARM, provided maps of the Conodoguinet, and Assistant Professor of Environmental Studies Kristin Strock and ALLARM staff provided Murphy with data about the creek’s water quality. Visiting Instructor of Environmental Studies Kim Van Fleet, an ornithologist, provided her field data on bird counts in Carlisle, along with data collected by her students. She also connected Murphy with 1840s surveys of local birds, conducted by Spencer Fullerton Baird, Dickinson class of 1840. The resulting mural uses the Conodoguinet Creek as a main motif, and shows the land surrounding it. A red circle indicates Dickinson's campus. Red and green dots represent songbird feeding and breeding zones, and color-coded lines signify migration patterns of indigenous birds. A forthcoming sign provides a key to the map. Larissa Babicz '20, a biology major, was a student-assistant for the mural project. Photo by Carl Socolow '77. On Saturday, Sept. 22, Murphy and Larissa Babicz ’20 (biology) sketched the outlines of the mural in pencil and numbered each area, indicating the paint colors that should be filled in. Student volunteers stopped by throughout the weekend to fill in the colors. Looking ahead, Murphy will visit campus in mid-October to talk about the mural, and to deliver individualized critiques to class of '19 studio-art majors. CSE plans to incorporate the mural into environmental awareness and outreach programming. Throughout the semester, students in Strock’s aquatic-environment class are measuring the nitrate and phosphate levels in local waterways, and Van Fleet and two students are comparing contemporary bird-count data with Baird’s 1840s work. Plans are to post findings online, along with scans of Baird’s documents and the QR codes that will be added later will point to this work. For students like Babicz, the project was a unique opportunity to work with a professional artist, while learning about Carlisle's natural resources and bird species. It also represented an ideal melding of interests for Babicz, a longtime birdwatcher and talented artist who has studied ornithology with Van Fleet and was on hand to help Murphy for all 13 hours of drawing and painting.